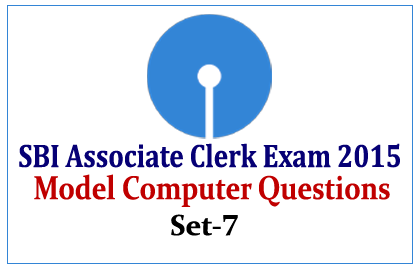 List of Model Computer Questions for SBI Associate Clerk Exam 2015 were given below. Candidates those who are preparing for those exams can use these questions to score more marks. 1).Which hardware device acts as both a switching and connecting unit? 2).Which device is assembles groups of characters into complete messages prior to their entering the CPU? 3).What is means by CD-ROM? 4).Which of the following terms refers to the ability of a computer to automatically configure a new hardware component that is added to it? 5).Which part of computer can touch and feel?